We all have those days and I have them at least once a month. 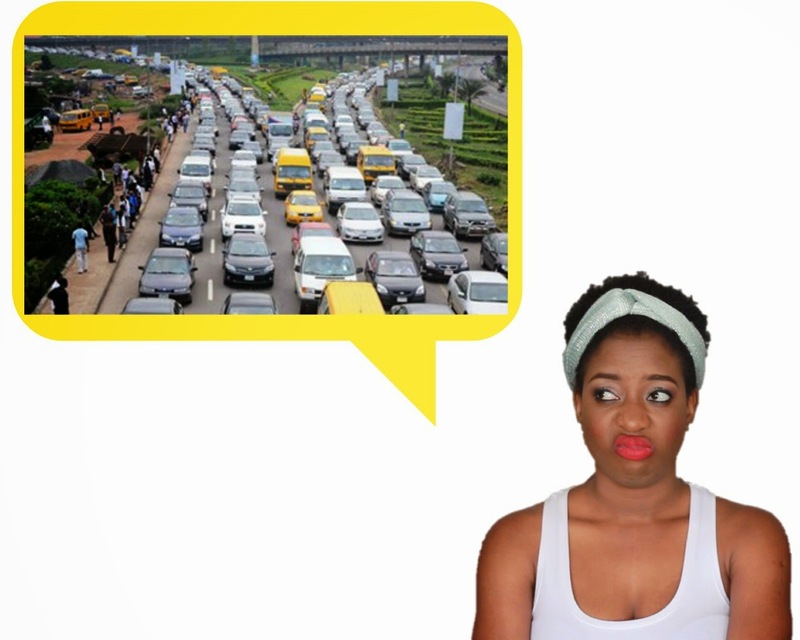 Living in Lagos is not moin-moin…unless you’re gbogbo bigz girls and bigz boys. For the normal person, Lagos is tough. Lagos is tough. Lagos is tough! How many times did I tell you? I cried a little before I went to bed last night because I was so so so tired of the hustle and bustle. I'm very sure the sun shinning in Lagos is not the one shinning in other parts of Nigeria. Kilode! Okay, I start my morning, very early by 5:30 but I snooze till 6: 00am. Some of my friends with kids are awake by 4:00 am…nitori Olorun…4:00am! Na which time dem kon sleep? Anyways, to even get up from the bed 6:00 is so much struggle and then when I open my eyes, the sound of generator just gives me headache! It is rare that there’s power all night…at least you’ll have to wake up at night to switch to generator at some point (that’s 1 hour of sleep lost). So I jump in the shower and if I’m lucky that there was power the day before the water from the heater will be warm, if it isn’t then I have to go and boil some water. These are things you people in obodo oyinbo do not consider as luxury, but I do. I love a shower in the morning so if I boil with kettle it means I go baff with bucket and "bailer". Third World Problems atink? Anyways, I have to hurry to work and from the start of my street, the traffic begins, sunkere, fakere… morning traffic is very annoying. I push that traffic from my area, through third mainland bridge, all the way to Lagos Island. I don’t like that bridge, but I spend at least 3 hours a day on it daily. Let’s skip the stress at work. My journey home is even more tiring…the same route back. If it was just traffic that one had to deal with it can still be managed, but I have to struggle to drive defensively. On some days I’m not so lucky, somebody must jam my car…and they will beg you in the name of the God you serve that dem nor get money to help you fix it – there’s nothing you can do about that. In the beginning my car was clean, right now it has scratches, bumps around it and I am not bothered to fix it! I've said my dream car to drive in Lagos is a TUNDRA make I kon see who nor dey fear face kon jam me. Woju oh! Apart from traffic, you have to dodge LASTMA who are busy hunting people down instead of doing their jobs...see as their eye dey red. You will still dodge crazy danfo, keke, okada…and then people that just stray into the road. Is there no sense at all? Where do you live? And does it stress you out like this? life can be more beautiful sisi yemmie. if your husband also works on the island, i think it is better you relocate. when we were living at agege and my husband was working on the island, he gets home 11 pm atimes and by 4am next day he is on the move. i suggested we relocated and we did. infact he is enjoying himself right now. he can leave his work by 6pm and get home 8pm. leaves home 6.30 or 7am in the morning. you dont have to rent an apartment in the high brow areas of the island. you know now, cut you coat according to your cloth. Please where is the place on the island that is affordable apart from inside Ajah that has off the chain traffic. Sisi you are lucky o. You wake up 6am. I wake 4.40am and by 5.30 I should be on the road if I want to get to the office early. Lol, one of the many reasons I doubt I can survive in Lagos. Even PH that I thought was better is getting worse! When I visited PH I was quite shocked to see how Lagos-y it looked! Garden city ko, garden city ni. Lol! Sorry o, I can imagine the frustration for you to even be crying (hugs). Please let me know how we can switch na....I want it bad bad...at least make I come taste a little of that loneliness. Lagos living is not for the faint-hearted. The Traffic gods keep winning, I spent nearly 1.5 hours on 3MBridge tonight, I was waiting to see if the cause of the blockage was an accident or broken-down vehicle but there was absolutely nothing, there was traffic just because! Wow! Sisi, u wouldn't pray for your enemy to live in badagry. Before u get to town, gbogbo ara lomo ro yan tan(you'd have bodypains). I wonder how my dad and others do it. I'd rather choose to settle with my family in places like Ibadan et all.upon all d gragra join, everything dey expensive. Hian! Just draining? My dear, it's weakening. Sometimes I get on the road home and see traffic that I'll sit in for an hour (which should typically be a 20+ minute drive) and I just get weak. From what I've noticed recently, I have to start leaving my house at 5:30am for work if I don't want to sit in traffic in the mornings. I have changed jobs 3times in d past 4years, and yes I have also moved houses 3times in d past 4years. People think we are crazy, me especially cos am d one that pushes for a change to a place closer to my new working place, (hubby has been at same coy).I detest traffic, it drains me..... Max I can stand is a 30mins drive to work and back. I live on the mainland. I'm lucky that I'm always moving against traffic. Home to work is less than 20 minutes by bus. Any other outings I plan myself well before going. You guys that drive in Lagos are the real superstars, my mind no reach. I stay in an estate so evening walks are a luxury I can afford. I love walking. The generator wahala is the one that cannot be helped. I haven't seen light for close to a week but wetin person go do? I live and work in Ilorin. I got into the shower at 7am this morning and I got to the office at 7:36! I wear my make up in the office. Even when I sometimes take my nephews to school, I still get to the office before 8. I close, 5:30/6pm. I'm home before 7pm everyday, except I branch this place or that. Though, it seems a lot of people are beginning to relocate here. When my friends visit, they marvel at how neat my car is, because there are no bashes here and there, except from my ''capital L'' days, which I just refurbished last month and is as good as new again. Talk of light, we are getting there. There's near stable electricity. At least in my area. #kwaraitsgoodhere. Only disadvantage of living here/like this is, there are only a handful of places to visit. You see the same faces everywhere, hence, bad market for a single girl. LOL. Asides, this one factor, I enjoy living here. NB: My office from home is like, Ojuelegba to Maryland, though there are plenty corner corner. Sisi yemmie, its really crazy out here in lagos..the major issues of Lagos are the heavy traffic and lack of electricity. I know how it feels to work on the island with all the stress because i did my IT on the island years back. Getting home 10pm-11pm every night was crazy, i was so happy when my 6-months IT programme was over. Like i usually tell my friends, the actual work we do in our respective offices isn't as stressful as what we actually face on Lagos roads to and fro. Its better for me now because my office is presently on the mainland but i usually feel sorry for people living in Ikorodu, Sango-Ota, Mowe/ibafo...their own suffering get part 2. As for the noise of the generators, i guess we are used to that already in Lagos. My Sisi na true you talk oooo, for me going to work in the morning (05:30am) na fun, but coming back from work is my poison, I stay at Agege, my working place is at Ikeja, sometimes I use over 2hrs in traffic just because I wan return from work, I wish Nigerian is a place where we have flying cars that when there is hold up I will just fly my car go house, Abi Wetin Una Think??? Lagos! My dear Lagos! I work in Apapa & live on the Island, I'm against traffic leaving & coming back so that's ok but Apapa has its days ooooo! Containers! Trailers! bad roads! But to God be the glory! It is well! As crazy as Lagos can be, I still miss it whenever I have to be away! I left "Hovas" to be here & haven't regretted & never will in Jesus name! The main thing is that you have to hammer well well so that you can enjoy Lagos. The one thing that really bugs me is the kind of driving Lagosians do, wetin dey do those danfo & recently keke marwa/napep guys! I really feel like flogging them sometimes, even private commuters! Why the impatience? Electricity palava!!! Bettter days are ahead! Living in Lasgidi is a talent. One ish I have with Eko Fashola is the traffic. I have been plying the mainland to V|Island route for over 4years now, it has not been easy. So to avoid high temperature and headache caused by the traffic, I sleep in the staff bus till I get to my destination. Sometimes, I wish house rent on the island were more affordable. Sisi Yemmie, I don't know why I read this and laughed my head off. I know it's stressful, but it's just funny. I don't know how people make it in Lagos walahi. I lived in Jos, so when I came to Lagos 14 years ago, I wept. I was used to the peace and quiet and oyibo weather of Jos, but Lagos was hot and crowded and noisy. Chei!!! HATED it. I haven't been there since then, and I don't look forward to being there. Ndo, my dear. And to think, I struggle to wake up at 7:30 AM AND I even work from home ooo --- unless I have a meeting to attend. Meanwhile, I never, ever set any meeting to start earlier than 10:00 AM. That is just my personal policy. Lol. Ndooo. Per having a Nigeria with no generator, don't hold your breath. Our ancestors wanted the same thing. Reminds me of Ajose Adeogun traffic after closing hours...not a nice experience. Aside draining, It is also depressing. That means me that wake up 8 o clock (if I am not in court) and get to work like 9 am or 10,leave office 5pm and am at home latest 5.30pm I am lucky niyen working and living in Ibadan..
My colleagues in lag don't enjoy the same luxury. Maybe I shld stop complaining of stress. i agree with the person that said living in lagos is a talent.the traffic is crazy and yes i complian of generators every blessed day..i pray one day light will be stable..